Blogger is acting up and I can't put a title on this....oh well. Do you guys do this? You buy books, you look at them...and you still design something yourself? I bought Sasha Kagan's new book about crochet. It is very good and I've enjoyed looking at it. I bought several Japanese books on crochet motifs, and yet I still designed the motifs in the picture. I have just finished another baby blanket, that I hadn't realized I didn't post about. (I took a pic, but the camera is now dead so I'll post about it later.) I've got lots of left over yarn, so I decided that it would be nice to put together some crocheted squares...which became circle motifs instead. I'm enjoying doing them. They are very simple and good stress relief since I'm home finishing up a paper for my MA, that is turning into a Diploma instead (long story...to long actually.) Anyway, I started this yesterday at 5 and I got all these done by 6:30.....and that is deciding what the pattern was going to look like. I have to admit, I'm loving the fact that crochet is back "in". Need to work on the sweater that I have the material for....these motifs are more fun! I tend to redesign everything I buy a pattern for especially for crochet (more comfortable with it). I love your motif! It is like a revamped classic! 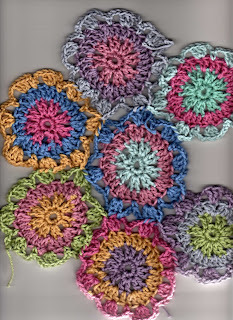 OH, those are cute little crochet motives!! Looks great!! Yep, I often do the same thing with books - and your crochet motifs are so cute and beautiful, they look fantastic!